NOVA SCOTIANS regularly complain about a lack of leadership in the province, and there are plenty of examples to back up that feeling. There are all kinds of groups with proposals that require spending tax dollars on infrastructure, but there doesn’t seem to be anybody who knows exactly how those plans will work to maximize benefits to the public. The latest example is the Halifax-Dartmouth Bridge Commission’s plans for a third harbour bridge. Infrastructure is a nebulous term that is used regularly to justify public spending on all kinds of things, but typically it refers to the building of structures and structural improvements that form a foundation for further development. The word was employed frequently by the major supporters of the Halifax bid for the 2014 Commonwealth Games until the provincial government wisely withdrew funding for the project. The big backers of the Games bid argued that spending more than $1 billion in public money on the event was justified because of the economic spinoff and infrastructure that would be left as a legacy for the Halifax region and the province. While the word often gets bandied about, infrastructure work usually means improvements to sewers, roads, bridges and public utility installations, such as waste-water and water works, electric power, communications, transit and transportation facilities, and oil and gas pipelines and associated facilities. On Tuesday, the bridge commission made a presentation to city council, advocating construction of a third crossing over or under Halifax Harbour. There is nothing new here; the bridge commission has been floating the idea for a least a year. The new link would likely connect south-end Halifax with the Circumferential Highway in Dartmouth’s east end. But I wonder just how a third crossing is supposed to fit in with the municipality’s desire for a downtown Halifax less focused on vehicles and the plan to create greater residential density in the downtown. Does the idea of building a third link across the harbour relate to Premier Rodney MacDonald’s plan to build a truck highway next to the existing railway line that cuts through the south end? I doubt it. How would it interfere with the financing of a high-speed ferry from Bedford? When talk surfaced last year that the bridge commission was bored with just taking care of the city’s two existing bridges and wanted something more exciting to do — such as building another bridge — the province should have told the commission, which it controls, to reconsider. This calls into question the relevance of maintaining a separate bridge commission. While there may have been a good reason for such a commission at one time, there is also a danger in having a single-purpose organization in such a position of power. Commission members only seem to understand a need for a new bridge and don’t have to consider how that might fit in with reducing the number of cars on Halifax roads or undertaking other projects that may have a higher priority for the public. Conspiracy theorists have told me they believe the effort behind building a third harbour crossing really isn’t serious; instead, it’s an exercise to support consultants and engineers who would be asked to study such a project. In fact, the commission has spent or is spending $300,000 on a study to evaluate the options for a new crossing. There are all kinds of projects on which taxpayers’ funds would be better spent, and the list is long. The last thing Halifax needs right now is a costly bridge project. This won’t be the first time I’ve suggested it, but it may be time to disband the bridge commission and hand over the duties of looking after the bridges to the Transportation Department or a regional transportation authority, which would look at various transportation options in metro. Right now, the idea of improving the transit system in metro doesn’t seem to enter the thinking of the bridge commission. Halifax may one day have its own Chunnel or a new bridge. With Halifax’s population growth and traffic congestion, metro may need a new south-end bridge or tunnel as early as 2016 to complement the A. Murray MacKay and the Angus L. Macdonald bridges, the bridge commission said Tuesday. The existing bridges, built in 1970 and 1955 respectively, aren’t going to be able to handle the increasing traffic volume much longer. With 32 million vehicles crossing the spans each year, up from about 24 million in 1981, the bridges are going to need some help, said Tom Calkin, chairman of the Halifax-Dartmouth Bridge Commission. The debate over whether metro needs a $1.1-billion, six-lane bridge or a $1.4-billion, four-lane tunnel has yet to be played out. But the best place for the third Halifax Harbour crossing has already been chosen. The new connector could link Highway 111 in Woodside with the CN rail cut at the south-end container terminal. The province has already said it plans to pave the south-end rail cut to accommodate trucks servicing the container pier as part of the Atlantic Gateway project. A study, done four years ago, revealed that the cost to pave and widen that could be as high as $50 million. In addition to construction costs for the new crossing and its approaches, land ownership issues would have to be resolved. Mr. Calkin said expropriation is an option. He hosted a media briefing Tuesday afternoon in advance of a presentation to regional council in the evening. In 2006, city hall asked the commission to get a study done. The tender for the early-stage analysis, at a cost of about $375,000, was awarded last March to Delphi-MRC. The report outlines that, at one point, 23 possible locations for the crossing were contemplated. The number was reduced to six. In addition to the south-end bridge or tunnel, the possibilities also include twinning the MacKay bridge on its north or south side. Traffic patterns show, however, that the desired crossing should be located closer to the institutions that commuters are trying to reach, including hospitals, universities and downtown Halifax’s financial sector. Another option suggested two tunnels to accommodate rapid transit only. The combined seven lanes on both bridges represent almost 30 per cent of the 22 entry points onto the Halifax peninsula. Growing commuter congestion is clogging those arteries, the report said. In 1999, there were only 25 days in which more than 100,000 vehicles crossed the bridges. Last year, there were 164 such days, the commission’s chief engineer told reporters. But when you take out weekends, holidays and summer vacation periods, the 164-day total represents 85 per cent of possible peak-traffic days, Jon Eppell said. "We are approaching the ceiling," Mr. Eppell said. "It’s an inevitable reality that an additional crossing has to be considered." He said there are a few options that could delay the need for a third crossing. Increasing bus ridership is one possibility. The city has about 12 per cent of commuters taking the bus. If that number could be increased to 18 per cent or even 23 per cent, the need for a third crossing could be put off for a few years. As well, charging more to let peak-time travellers cross the bridges could create a staggered effect in bridge traffic use, Mr. Eppell said. Planning should start now for a crossing that will be needed between 2016 and 2026, he said. The studies that must be done beforehand could take years to complete, Mr. Eppell said, and construction could take up to four years. "It may seem premature to some people that we are discussing this," said Steve Snider, the commission’s executive director. "But we need to take steps now. We can’t leave it all to chance." The MLA who represents Halifax’s south end says it’s irresponsible for public officials to float "trial balloons" that create uncertainty and angst. "It will destroy the neighbourhood . . . and create a public thoroughfare," Leonard Preyra said Tuesday. "You’re going to have trucks, you’re going to have trains and you’re going to have emergency vehicles and commuter traffic moving right across the harbour and funnelled into this very narrow rail cut that can just barely take one rail line at the moment." Halifax Mayor Peter Kelly said the idea of a third harbour crossing is worth considering, although he added that such a project would be costly and there are "a lot of unknowns." He said the city is willing to explore the possibility, but he noted that the final say rests with the province. Mr. Kelly said regional council could only vote to earmark money for municipal elements of a third crossing that would need to be included in the development. Mr. Kelly said "the two bridges now are the responsibility of the bridge commission," a provincial Crown corporation. The mayor said if the proposal goes ahead, the municipality will need to determine its share of infrastructure costs. But Mr. Kelly said it is premature to talk about a planned third crossing because the price tag raises "a lot of questions as to how and why, and is it needed." Premier Rodney MacDonald said planning for metro’s transportation needs is crucial. He said a potential third crossing would have to take the environment into account. "I think what the bridge commission is doing . . . is absolutely the correct thing to do," Mr. MacDonald told CTV News. Council approved a motion Tuesday night to send the matter to staff for a report. To review the study completed by Delphi-MRC, click on www.needsassessment.ca. 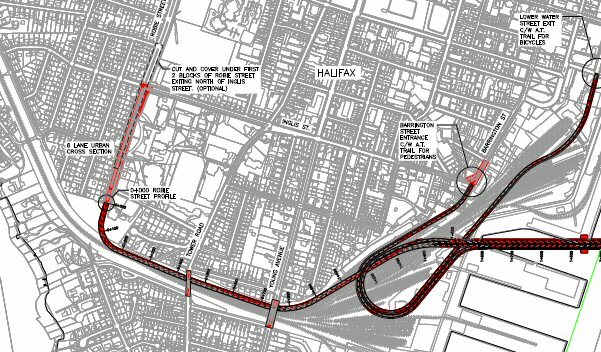 The cost of reconfiguring the CN rail cut from south-end Halifax to Fairview to relieve downtown Halifax truck congestion won’t be cheap, says an engineering study done four years ago. A report by Marshall Macklin Monaghan Ltd. of Toronto and Atlantic Road and Traffic Management of Halifax looked at five options, with only two considered real possibilities. Halifax Regional Municipality commissioned the report. One option would cost $40 million, the second nearly $51 million. Those costs do not include allowances for replacing, rebuilding and excavating near bridges. Costs would now be higher because of inflation. And if the project was ever done under a private-public partnership, as suggested by the province, daily operating costs for those using the corridor could be covered with a toll. The topic of a multi-transportation corridor using the CN rail cut resurfaced when Premier Rodney MacDonald announced several weeks ago the list of projects the province would like to see included as part of the Atlantic Gateway strategy. The cost of these projects, including the rail cut, would be in excess of $300 million, with funding coming from governments and the private sector. Most of the downtown truck traffic comes from the Halterm container terminal. The premier said using the rail cut would move trucks away from the downtown out to Fairview, where they could connect with the Bicentennial Highway. The premier also said the corridor could be used by buses and emergency vehicles. David McCusker, the municipality’s manager of transportation planning, said Tuesday the purpose of doing the study was to get an understanding of the project before any decisions are made. "We did that study intentionally without the involvement of CN because we had heard it couldn’t be done," he said. "We wanted to have an understanding ourselves of what could be done and what couldn’t be done so it gave us some background information before we went into further discussions and negotiations with CN." The $40-million option is a single roadway alongside the rail track. Traffic would have to follow daily direction schedules. Rail operations would not be affected. The second option proposed two paved lanes with the rail track embedded in a traffic lane. When trains were not using the corridor, both lanes could be used for traffic. When trains were in the corridor, only one lane would handle traffic. Special traffic signals would be needed. The first option, if used, would require a waiting area for vehicles at each end of the corridor. The cost of developing these staging areas was not included in the study. The study also talks about additional excavation of the rail cut and a property acquisition allowance for both options. Expropriation of private land would be a possibility. A CN spokeswoman said Wednesday there have been no formal talks with the province, but CN is open to discuss the corridor project. Mr. MacDonald said recently the province is anxious to move forward with the work. "We hope to get this announced in the next number of months and begin work as soon as possible, this year or next year," he told reporters after a recent cabinet meeting. Local and international experts said Wednesday they don’t believe the rail cut changes will solve the problem. They say the rail cut would just move congestion points to the edge of peninsular Halifax. It does not address the fact that over 60 per cent of regional container traffic moves by truck from points beyond Truro. They say several other ports have addressed this type of problem by building inland ports adjacent to the main rail line in greenfield locations. Containers would be shuttled by rail from the port to a logistics park. The concept of a logistics park in the Burnside area does not fit this model as it is not on the CN main line, said the experts, who asked not to be named. If the Gateway strategy is to succeed, there needs to be a greenfield inland facility on the CN mainline with lots of room for expansion in close proximity to Halifax, they say. They cited the Virginia inland port as a successful example. Stephen Greene, the premier’s deputy chief of staff, said Tuesday the province "hasn’t released costs on any particular piece of what was announced and the reason for that is the federal government has to come to the table." However, he said costs in the 2004 study "are no doubt in the ballpark." Mr. Greene said Ottawa has set aside $2.1 billion over seven years to assist funding of Gateway projects. He said the memorandum of understanding signed last fall between Ottawa and the four Atlantic provinces outlined a process that could take up to two years just to get project lists assembled and submitted for approval. "We in Nova Scotia have been talking and thinking about Gateway for a long time and the other provinces have not, so we are probably a lot more advanced in the development of our list of projects," he said. He suggested it could be awhile before there are any federal announcements. "The ball is in their court," he said. Converting the CN rail cut in south-end Halifax to a proposed truck and bus route might slightly improve commuter traffic flow, a city hall traffic manager says. "Some truck traffic may be taken off commuter roads," Dave McCusker said Friday about the proposal. "But it’s not our expectation that commuter traffic would get access to it." Work on creating a new route for trucks and buses using the rail cut from south-end Halifax to Fairview could begin as early as this year, Premier Rodney MacDonald said this week. "We want to get moving on it," he said Thursday. "We hope to get this announced in the next number of months and begin work as soon as possible — this year or next year." But if the province is counting on federal dollars to propel the project, Ottawa may have the last word on when work begins. A Transport Canada spokesman said recently that no federal money is being offered at this point. Last year, Atlantic premiers and Ottawa signed a memorandum of understanding to develop an Atlantic Gateway as an entry and exit point for international trade. As part of the agreement, the partners agreed to spend two years hashing out various issues surrounding the gateway, including its potential effects on the region’s transportation system and partnerships with the private sector. ,b>If the rail cut plan proceeds, proponents could have a fight on their hands before construction begins. Coun. Sue Uteck (Northwest Arm-South End) has already heard concerns from area residents. Regarding metro’s commuters — those workers who drive to peninsular Halifax from bedroom communities such as Bedford, Lower Sackville, Cole Harbour, Tantallon and Timberlea — the idea of a rail shuttle into the city is dormant, Mr. McCusker told The Chronicle Herald last year. Commuter rail is something that Mayor Peter Kelly has campaigned on in the past. "Even taking the issue of track ownership out," Mr. McCusker said, referring to CN Rail, "the economics just didn’t make sense at all. The cost to bring (commuter train) seats into the downtown was quite high (and) the trip times are not very fast." On Friday, Mr. McCusker said the concept isn’t officially dead, but it’s close. "Through the (city’s) regional plan, we did say that we would preserve opportunities to do (commuter rail) in the future," he said, "but there are no immediate plans other than buses and ferries." I USED to think the Atlantic Gateway was a code name for a government project specifically aimed at turning Nova Scotia and New Brunswick into a major North America entry point for cargo from India and the Far East. But it seems Nova Scotia may be working with a broader definition. Rather than providing a means of creating a long-term strategy for specifically developing the province’s unique potential as a major transportation hub for North America, Premier Rodney MacDonald seemed to outline a plan Wednesday that tries to achieve several short- and longer-term political goals at the same time. For example, building a connector road linking Burnside Park in Dartmouth with Sackville Business Park has long been on the agenda for regional development. Such a road had been proposed as a goal of several previous governments and when there wasn’t enough money to justify public funding for the road, private developers had proposed building a toll highway to connect the business parks. How does the construction of the Burnside connector tie in with the Atlantic Gateway? It does if the plan includes building a logistics park near Burnside. Instead of the government proposing a logistics park, however, I believe the creation of such a park would work best if it was led by the private sector. If the private sector is in the lead, we will quickly learn if it also makes economic sense.To help sell the idea of public funding for a logistics park, the premier told the Halifax Chamber of Commerce that he wants to create a logistics school in conjunction with universities and community colleges. Perhaps the logistics school should been developed prior to the government creating its list of ideas for spending Gateway money. If the aim is to create a fast and efficient movement of containers through Nova Scotia, such a school might be able to come up with ideas that are more effective than those revealed Wednesday. The province wants to create a paved road next to the railway tracks in south-end Halifax that would provide a quick getaway for trucks carrying containers from Halterm. There isn’t anything new about that idea either. People have been making all kinds of suggestions for the rail line that runs through the south end. Some had wanted a walking trail to be built next to the rail line. Others thought the existing line would be ideal for commuter rail to ease congestion on the city roads leading into the south end. The premier said the dream of providing more efficient movement of containers through the Port of Halifax by building a paved road next to the rail line will create an environmental dividend by reducing the number of idling trucks polluting the atmosphere while they’re stuck in city traffic. The money would also be used to finance the twinning of the Trans-Canada Highway to the Strait of Canso. Some would suggest that the highway should be twinned all the way to Sydney. But Premier MacDonald has different priorities. He said Wednesday that the money will be used to dredge Sydney Harbour to allow for larger ships to reach that port. There isn’t any evidence dredging will lead to container ships using Sydney. But one thing is certain, if Sydney becomes a trans-shipment point, one of the bottlenecks will be inadequate roadways and rail. In my opinion, rail should be the focus of any Atlantic Gateway concept. If used right, rail offers the most efficient and environmentally friendly movement of containers from Nova Scotia ports to delivery points inland. I’ve been told that one of the reasons Halifax isn’t attracting more traffic is the lack of a competitive rail service. If Nova Scotia helped to develop an efficient rail network throughout the province, it could open all kinds or doors to future development and may attract a rail competitor to CN. How about creating a fast commuter rail link between Halifax and Truro, with a stop at the Halifax airport? Building up the rail from the Strait of Canso would also guarantee the success of the Melford Terminal, which is about to be built by private developers in Guysborough County. With containers coming from Halifax and Melford, and eventually Sydney, perhaps a major rail hub could be created in the Truro area. Admittedly, everyone has their own ideas and biases, but hopefully the plans that the province unveiled this week are mere suggestions for the Gateway concept. One thing is certain. There is plenty of time because Ottawa isn’t ready for the idea yet. A plan to create a new route for trucks and buses using the CN rail cut from south-end Halifax to Fairview could be underway as early as this year, Premier Rodney MacDonald says. "We want to get moving on it," he said Thursday after cabinet. "We hope to get this announced in the next number of months and begin work as soon as possible, this year or next year." But if the province is counting on federal dollars to move the project forward, Ottawa may have the last word on when the work actually begins. Brian Bohunicky of Transport Canada said Wednesday federal money isn’t being offered at this point. "We haven’t invited applications for funding under the gateways and border crossings fund," he said. "What we have done is worked very hard and put in a lot time working directly with provinces and the private sector to develop an Atlantic gateway strategy under the MOU (memorandum of understanding) that ministers (Lawrence) Cannon and (Peter) MacKay signed with counterparts in all four Atlantic provinces." As part of the agreement, signed last October in Halifax, Transport Canada, ACOA and the four provinces agreed to spend two years hashing out a number of issues surrounding the gateway, including potential effects on the region’s transportation system and partnerships with the private sector. On Thursday, a Transport Canada representative said there is nothing further to add regarding funding and there is no date set as to when funding applications will be accepted. The federal government has set aside $2.1 billion over seven years for gateways and corridor projects. "The (agreement) we signed said that there is a lot of work to be done among the governments, and there are some immediate-term actions, particularly with respect to marketing the system and the assets that are in place and have untapped capacity," Mr. Bohunicky said, adding there is a lot of behind-the-scenes work being done on a daily basis at various levels of government on the gateway plan. The premier said the province has started looking at similar projects elsewhere in the world and how much they cost. "The government intends to get those trucks out of the downtown area. It’s an issue of getting the product to market. It’s an issue of safety for our citizens. It’s an issue of reducing greenhouse gas emissions and providing more opportunities, whether they live in Timberlea or Halifax-Clayton Park or Bedford or other communities, with respect to transit in the downtown." Mr. MacDonald said there are different types of designs that would reduce the noise of corridor traffic, but he said the details will "come another day." "But make no mistake, the government intends to move in this direction." Mr. MacDonald said the wish list of Atlantic gateway projects he unveiled Wednesday would have to get funding from other levels of government as well as the private sector. The premier wouldn’t say how much the transportation corridor would cost but said the entire package of projects is estimated to be worth more than $300 million. South-end resident Hugh Pullen called the idea of converting the rail cut "a pie-in-the-sky proposal" and questioned whether CN would want it. "To run buses and container trucks and the fire department and the ambulance service and the police up and down the railway cut might be a bit difficult, especially if you meet a train coming the other way," he said. "Trains don’t stop easily." Mr. Pullen, who is president of the Peninsula South Community Association, said the noise from the railway, which he describes as a low rumble, isn’t all that disruptive. He said he suspects some of the biggest boosters of the project would be those who want to develop condos on Hollis Street and other parts of downtown that have heavy truck traffic. Three years ago, a spokesman for CN Rail said there would be costs involved in setting up a truck route on the rail cut. "At the end of the day, the fact of the matter is, we are not a public utility," Mark Hallman said in 2005. "Our assets aren’t free." Provincial Liberal Leader Stephen McNeil said he was pleased to hear the announcements but said it "really seems like a wish list from the premier" with no real timelines for the projects. "They have been talking about twinning Highway 104 since 1999. Why should Nova Scotians believe it is going to happen now without these timelines put in place?" he said. "It is important (that) as a province, we focus on our own transportation infrastructure on land to make sure when the private sector begins to invest in our ports, we have the ability to move those goods across land to their destination." However, the Liberal leader said the premier’s announcement lacked substance, especially his plan to use the CN rail cut from the south end of the city as a transportation corridor. "I don’t think the premier should be negotiating in the public. There was an announcement about a corridor, but there isn’t even a deal. That is not the way you do business. You negotiate and talk about ideas at the board table." He said he was surprised to hear the premier talk about the rail cut project and then hear CN saying Wednesday it was willing to talk but there was no agreement. HALIFAX - Nova Scotia Premier Rodney MacDonald says funding to make the province a commercial gateway for goods from Asia will come from through a combination of sources. The premier has proposed plans for new roads, a refrigerated container terminal and the dredging of Cape Breton's Sydney harbour as part of his gateway strategy. He says the $300 million bill will be financed through various levels of government, the private sector and, potentially, access to Ottawa's $2.1 billion fund for gateway projects. But MacDonald isn't ready to give specific details, saying they will come in the months ahead. He says the one sure thing is that the government intends to rid downtown Halifax of trucks travelling to the Ocean container terminal in the city's south end. MacDonald says building a new road beside a rail line in the area is a matter of safety and getting products to market faster. PREMIER Rodney MacDonald delivered a $300-million, full-breakfast menu on Wednesday with a promise to pursue major infrastructure projects to launch Nova Scotia as North America’s Atlantic transportation gateway. The premier gave a morning address to the Halifax Chamber of Commerce with five wish-list projects for the federal government to consider under the $2.1-billion federal gateways and border crossings program over the next decade. We’ll see if MacDonald has bitten off more than he can chew, though, with his plan to pave a strip of the CN rail cut that runs from Halifax’s south end to Fairview, primarily to aid the struggling Port of Halifax, while ridding clogged downtown streets of overwhelming container truck traffic. There will surely be a ruckus raised by many of the homeowners who live in high-end homes adjacent to the rail cut. Strident opposition may also be expected from groups that have called for additional recreational use of land in the rail cut. But the bottom-line argument is sure to come down to the economic reality that the port — long defined as the primary economic engine of this province — is faltering due to stiff competition, and needs help to regain its edge. "There is no doubt that the Port of Halifax is the premier container destination on Canada’s east coast," MacDonald said on Wednesday. "But if it isn’t functioning to its potential, the port can’t be the engine of the Atlantic Gateway that we know it can be." In the transportation world, time is money. Containers on trucks that idle in downtown gridlock as part of a one-hour trip out of Halterm to access the 100-series highway system place the port at an immediate disadvantage. The plan would most likely see a federal-provincial-private partnership developed, with CN as the landowners serving as the private element. And while we’re on the topic of competition, it is worthwhile asking whether CN has done all it could to assist the port in remaining competitive, and whether a partnership position in the rail cut project might advance that objective. The road could also be used by emergency vehicles and MetroLink buses, thereby reducing commuter traffic to and from the peninsula. The other projects cited by MacDonald include the long-awaited Burnside connector highway between the 102 and 107 highways, plus the new Gateway Logistics Park adjacent to Burnside, for the storage or transfer of containers to truck or rail. The plan also calls for the twinning of the Trans-Canada Highway from Antigonish to Port Hawkesbury, the dredging of Sydney Harbour and construction of a refrigeration unit at Halifax Stanfield International Airport. Halifax Coun. Sue Uteck admits a plan to pave the rail cut puts her in a difficult spot. "The port is lagging and this is one of the things they have asked for," she told me Wednesday. "They are responding to the needs of the manufacturing industry." She says she expects to hear concerns from residents, "but one of the things they can’t say is, ‘You don’t know what I’m going through,’ because I live right there." The four Atlantic provinces signed a memorandum of understanding last fall with Ottawa to develop potential gateway projects over the next two years. It could be some time before consultation, negotiations and paperwork are to the point where construction occurs. Still, MacDonald has devised a game plan to better position the province to capitalize on evolving transportation opportunities. Securing the competitive position of the Port of Halifax — despite the controversy his solution will create — has to be the first step towards getting Nova Scotia back on the road to prosperity. Premier Rodney MacDonald gave a broad outline today of the potential infrastructure projects that will help transform Nova Scotia into the Atlantic Gateway of North America. Specifically, the premier highlighted a new multi-transportation corridor to Halifax's Ocean terminal, a new Gateway Logistics Park adjacent to the Burnside Industrial Park, the Burnside Connector, twinning Highway 104 from Antigonish to Port Hawkesbury, a new refrigerated terminal at Halifax Stanfield International Airport, and dredging Sydney Harbour as part of the initial proposed changes. "We need to transform aspects of our infrastructure in order to meet the economic opportunities that importing and exporting will offer in the years ahead," said Premier MacDonald, at a Nova Scotia Chambers of Commerce breakfast today, March 5, in Halifax. "These projects are tangible examples of how we can reach our full Gateway potential, and also meet our government's immediate priority of building better roads and infrastructure -- another step toward a new Nova Scotia." be available for emergency vehicles and commuter-link buses, which would also further reduce emissions. "The multi-trans corridor is the perfect example of a Gateway project because it helps us move toward our environment, economic and infrastructure targets simultaneously, and creates a business advantage for a company choosing Nova Scotia as its Gateway," said the premier. Gateway Logistics Park, which would be adjacent to the Burnside Industrial Park, would receive containers that do not go to final destinations immediately. There, they could be broken down into smaller shipments, or combined with others to create larger shipments. The logistics park would also include a new Logistics Centre of Excellence to allow for skills training and development, and research into transportation and logistics, which would be led by Nova Scotia's community colleges and universities. The premier also listed twinning Highway 104 from Antigonish to Port Hawkesbury and dredging Sydney Harbour as Gateway projects that will improve the efficiency of transporting goods to or from the Strait or Sydney ports. The premier thanked the various groups that offered input into the project list, including the Halifax and Nova Scotia chambers of commerce, the ports of Halifax, Sydney and Strait Superport, the Greater Halifax Partners hip, Atlantic Provinces Economic Council (APEC), Atlantic Institute for Market Studies (AIMS), Halifax Regional Municipality and the Atlantic Canada Opportunities Agency (ACOA). "Our list of Gateway projects come predominantly from the private sector, and I thank them for their input; we've listened carefully to what these experts have told us," said Premier MacDonald. "But this list is not the complete Gateway picture. What we have today are the initial results of thinking differently to take advantage of the immediate Gateway opportunity. "I encourage Nova Scotia's business community to do the same -- think differently, and think big to find your place within the Gateway concept." "The Inland Terminal would require that a perfectly equitable sharing of all the costs and benefits associated with teh use of an Inland Terminal be negotiated, otherwise the total cost to move freight through the Port Halifax (sic) would increase. The concept is not attractive to Carriers who fear that they would end up with increased costs." Premier Rodney MacDonald has unveiled details of a plan he hopes will turn Nova Scotia into an international powerhouse for handling cargo. The Atlantic Gateway plan includes building roads for trucks alongside urban-area railway tracks, a cargo-handling logistics centre, and twinning of sections of the Trans-Canada Highway. "Certainly it's my hope that by summer we could see something go forward," MacDonald told the Nova Scotia Chambers of Commerce Wednesday. He said the province should take advantage of its location and deep, ice-free ports to take on more container traffic from around the world. Federal infrastructure funding would cover some of the costs involved, the premier said, though most of the money would come through private-sector investment. Widening the rail line through Halifax and building roads for trucks next to it. Building a freight-handling facility in Dartmouth's Burnside Industrial Park. Creating a new connector road to get in and out of the Burnside site. Twinning of Highway 104 from Antigonish to Port Hawkesbury. Dredging Sydney Harbour to allow for larger vessels. "Yes, they are ambitious projects, but a multi-transportation corridor is going to get product onto the 100-series highways much more quickly," MacDonald said. "It's safer for our residents. It gets large truck traffic off our streets." The premier said these changes to build up the freight business would revamp the province's economy. For people living in south-end Halifax, the new roads would change the shape of the neighbourhood. Coun. Sue Uteck said the municipality looked at the possibility of using the existing railway cut for a trucking lane, but decided the estimated $52-million cost was too much. The proposal didn't go over well with local residents, she added. "There was a lot of objection to having additional trucks, as well as trains, in the cut," Uteck told CBC News. Uteck said she has been assured by the premier's office there will be a round of public consultations when there are more details. There's also a benefit to the municipality, she said, noting the premier's plan allows emergency vehicles and MetroLink buses to use the trucking corridor. Don Rowe, with the Port of Sydney, welcomed news that the port is included in the premier's transportation plans. "It's the fact that they consider Sydney Harbour part of the gateway for Atlantic Canada," he said. "It gives it another level of support, and we think that's important." Rowe estimates dredging the harbour will cost about $40 million. He said it needs to be completed by 2011 if Sydney is to take advantage of new opportunities. Both "trucks in the cut" and "inland freight terminal" options for freight transportation are proven to be feasible in this report. "The options all use the physical expanse of the rail corridor more extensively. The options would preclude the Greenway trail from passing under the major road bridges, because of the limited horizontal clearance under the bridges. However, it is understood that the Trail is only expected to pass under Quinpool Road. It is also possible that the presence of trucks together with trains in the corridor could be regarded as incompatible with the concept of the Greenway as a "river of greenery" (as described on the Greenway website)". "Most of the concepts discussed in this report require utilization of the second, unused rail track in the corridor. That would preclude the Greenway trail from passing under the bridges which span the rail corridor. (It is understood that the trail is currently foreseen to only pass under Quinpool Road.) However, our review of the corridor indicates that in some sections of the corridor, it would be possible to make these connections via the local street network. Thus the Greenway could be developed as a corridor combining on-street and off-street sections. Also, based on our on-site observations, it should be noted that in some locations, it is believed that the steepness of the rock cut could preclude the introduction of the Greenway within the rail corridor property. This would require a detailed investigation, once a decision has been reached with respect to the preferred alternative for managing truck and/or commuter bus traffic." Robie Street Connector as First Phase ? The "inland freight terminal" is shown to be the more economically-sound option. The Railway Cut, linking the Bayers Road/Bi-High entrance and the South End Terminals, can be looked upon as an underutilized transportation resource within HRM. However, CN has determined that paving over the tracks is impractical and only oneway traffic could be accommodated. The use of the railcut as a truckway could remove an estimated 270 one-way truck transits from downtown streets. While the truckway has a beneficial impact on trucking times and costs, road maintenance and greenhouse gas emissions, these benefits are insufficient to justify the $40M required to modify the railcut to accommodate one-way truck traffic. "...on the Halifax side of the crossing, the four general traffic lanes to and from the (bridge or tunnel) (2 lanes in each direction) extend into the existing CN Rail cut to provide a connection to Robie Street." "...shoulder transit lanes would provide transit priority between Robie Street and the tunnel entrance. Shifting the existing rail lines to the south is required to accommodate this connection. Additional right of way may be required to accommodate the tunnel portal." "No exclusive BRT/HOT (Bus Rapid Transit/High Occupancy Tolling) connection to Robie Street is provided. Shifting the existing rail lines to the south and replacement of the existing Young Avenue and Tower Road bridge structures is required to accommodate this connection." "Robie Street south on Inglis Street will also require widening to a 6 lane urban cross section to accommodate projected traffic volumes." "As an alternative to an at-grade connection at the south terminus of Robie Street, providing a connection below the current street level through the use of a cut and cover tunnel would reduce the impact on the local road network and neighbourhood. The additional costs associated with the cut and cover connection option have been estimate at $100,000,000."